Must be an adult kython with no levels in another kython prestige class. Poison spray: A Slaughterking can spit poison in place of a bite attack. It must make a ranged touch attack with a range of 5ft per HD. On a hit, the target is subject to the Slaughterking's poison. Ability boost: A Slaughterking gains a +1 bonus to strength at levels 1, 3, 5, 7 and 8, and a +1 bonus to constitution at levels 2, 4, 6 and 8, for +5 Str and +4 Con at 8th level. Insinctive cunning: A Slaughterking is much smarter than it looks, and even more cruel, not hesitating to use his own allies as meat shields. A Slaughterking gains 20% miss chance against all attacks for every ally it has adjacent to it, up to 80% miss chance. Debilitating screech: A second level slaughterking can generate a loud shriek which disrupts the equilibrium of any nonkythons that hear it. Any creature within range of the Slaughterking's blindsight must make a will save(DC 10 + 1/2 HD + constitution modifier) or have their mobility Inhibited. Affected creatures take a -2 penalty to attack rolls, a -4 penalty to dexterity, and have their speed halved for 1 round. In addition, flying creatures are forced to land as quickly as possible while burrowing creatures are driven to the surface. The Slaughterking can use this ability as a free action every 2d4 rounds. This is a sonic, mind affecting effect. Growth:At third level, a Slaughterking grows one size category. If all Slaughterking levels were taken, it grows again at 14 HD and 20 HD. Broodlord: at fourth level, a Slaughterking's cunning keeps improving, allowing it to coordinate it's minions with subtle subsonics only the slaughterking itself is aware off. Allies inside his blindsight range gain +1 Insight bonus to attack rolls for every 3 HD of the Slaughterking, and they may re-roll failed saves against fear and mind-affecting effects. In adition, this ability can be used for comunicating with other creatures like telepathy with a range of 1 mile per HD, except that only very basic concepts can be transmited, like "feed", "come", "stay" or "attack". Enhanced defense: At fifth level, a Slaughterking can halve the range of its blindsight to create a protective barrier. The Slaughterking gains a deflection bonus to armor class equal to a 1/3 its HD, and spell resistance equal to its HD + 11. Disruptive field: A sixth level Slaughterking can halve the range of its blindsight to generate a field that disorients any nonkythons in the area. Creatures in the feild take a -1 morale penalty to attacks, saves, ability checks and skill checks and caster/manifester/initiator level for every 4HD of the Slaughterking. Done by Crafty_Cultist from GITP, some tweaks by me. Half Animated Object Golems|Heal from Cold damage. Half Blood Golems|Heal from Repair/Cure* spells. Half Cadaver Golems|Heal from negative energy damage. Half Candle Wax Golems|Heal from Fire damage. Half Coal Golems|Heal from Fire damage. Half Colossus Flesh Golems|Heal from negative energy damage. Half Colossus Iron Golems|Heal from Electricity damage. Half Colossus Stone Golems|Heal from Cold damage. Half Feuer Iron Golems|Heal from Fire damage. Half Greater Stone Golems|Heal from Cold damage. Half Grisgol Golems|Heal from negative energy damage. Half Razor Golems|Heal from Fire damage. Half Remnant Golems|Heal from negative energy damage. Half Sickstone Golems|Heal from Acid damage. Half Survey Stone Golems|Heal from Cold damage. Half Tod Iron Golems|Heal from ElectricityElectricity damage. Half Walking Statue Golems|Heal from Cold damage. Half Warfoged Raptor Golems|Heal from Electricity damage. Cadaver-Candle Wax-Coal-Colossus Flesh-This material is the result of long and powerful necromantic rituals used to bind the fallen soul of a powerful creature into one unimaginably large construct, sometimes a small portion from an long since dead Flesh Colossus is used in The Danger.The Danger by 15. However once grafted this Material provides a +2 bonus to Wisdom, further when the Half Colossus Flesh Golem gains Magic Resistance at 3rd level, this resistance applies to spells andColossus Iron-The Danger. The raw amount of magic within this material makes it incredibly volatile to graft; increase the DC of The Danger by 15. However once grafted this Material provides a +2 bonus to Strength, further when the Half Colossus Iron Golem gains Magic Resistance at 3rd level, this resistance applies to spells andColossus Stone-This material, while substantially more stable than its Flesh and Iron kin, is still beyond the grasp of even the most meta-arcane philosophies of the greatest of wizard scholars. Sometimes a small portion from an long since dead Stone Colossus is used in The Danger. The raw amount of magic within this material makes it incredibly volatile to graft; increase the DC of The Danger by 15. However once grafted this Material provides a +2 bonus to Constitution, further when the Half Colossus Stone Golem gains Magic Resistance at 3rd level, this resistance applies to spells andFeuer Iron-This material is wrought from the same strong metals that compose Half Iron Golems, but contains a powerful fire-elemental powered matrix. This material gives extra protection to the Half Feuer Iron Golem. After it has engaged in at least one round of combat the Half Feuer Iron Golem can act as if it were under the effects of Fire ShieldGold-Greater Stone-Grisgol-This material is composed of long dead bits of magical materials, lost or destroyed in ages past, that have gathered around the entrapped life-force of a lich within its phylactery, offering a great deal of magical potential to the Half Grisgol Golem. The Half Grisgol Golem effectively gains an additional level, for purposes of Caster Level, Spells Known, and Ability to cast spells per day as if it had gained a level in any spellcasting class it had access to before taking its first level of Half Grisgol Golem, if it had more than one spellcasting class before taking its First level of Half Grisgol Golem, it must select one to gain this benefit. If the Half Gisgol Golem did not have an Arcane Caster class before, or if it does not wish to increase said casting class, it gains this benefit as for a 1st level Sorcerer. It only gains this increase at first level. Mask-See Invisibility as a spell-like ability 1/day per HD it possess, its caster level is equal to its HD. Razor-Remnant-This material is particularly fascinating as that it is not as much a material but the very animating spirit of a long since maddened elemental believing it shouldThe DangerSickstone-Survey Stone-Tod Iron-Walking Statue-This material is carved of dense stone and animated with the flowing spirit of a water elemental, and is naturally self-preservative. The Half Walking Statue gains Fast Healing equal to half its HD. In addition the Half Walking Statue Golem gains a racial bonus on Spot and Listen checks equal to half its HD. Further, if the Half Walking Statue Golem passes within 5 feet per HD of an invisible creature or object the Half Walking Statue Golem may make a Spot check at a -20 penalty to notice such a creature. The creature or object remains invisible to the Half Walking Statue Golem, but it may use this ability to locate invisible creatures or objects that are close to it. Warforged Raptor- This material is fantastically shaped steel and mithral worked in such a way that, with the aid of its air elemental essence, it is well suited for areal travel. The Half Warfoged Raptor Golem never suffers from falling damage and falls at a rate of 20 feet per round, even while unconscious its grafted wings snap open slowing its fall. Upon reaching 5 HD it gains the ability to glide 20 feet in any direction for every 10 feet it falls, its maneuverability is average. Even if it manages to gain perfect maneuverability the Half Warfoged Raptor cannot hover while gliding. Upon reaching 10 HD the Half Warforged Raptor is capable of flight with a 40 ft. base flight speed and an average maneuverability. Skills: 2+int modifier, quadruple at 1st level. Class skills are Concentration, Diplomacy, Disguise, Heal, Intimidate, Knowledge (Any), Listen, Perform, Sense Motive, Spellcraft, Spot, Survival..
Proficiencies: Aasimar are proficient with simple and martial weapons and light armor. Holy Body:At 1st level an Aasimar loses all racial bonuses it had and gains outsider traits (basically darkvision 60 foot). It is an outsider with base speed 30 ft.
An Aasimar gains a bonus on Spot and Listen checks equal to his HD and resistance to acid, cold and electrecity equal to half his HD. Lightbringer: 1/day per HD the Aasimar can use Daylight as a SLA. If he uses his daylight on his weapon, it can add his Cha to to Hit and Damage rolls with that weapon for the duration of the SLA. As it grows stronger, an Aasimar learns how to use his power in more powerfull ways. All of the following abilities, unless otherwise noticed, are activated as a swift action, cost a certain number of Daylight SLA uses and last 1 round. In adition, whenever one of the abilities below is used the Aasimar's main weapon/holy symbol/eyes glows intensily as if made of pure light, imposing a -40 penalty on hide checks and providing illumination as a daylight spell for the duration. Light Soul-At 2 HD, by one use, the Aasimar can may boost the Caster level of any spell or SLA with the light, healing or good descriptor by 2, and that spell ignores any limit on Caster level it may have. Light Ray-At 4 HD, by one use, the Aasimar can project light rays from a melee weapon. Those rays have a range of 20 foot per HD, hit as a ranged touch attack and deal the base damage as the weapon used, whitout counting for any bonus or penalty for Str or Cha bonus. You can perform iterative attacks with this if you have enough Bab or any other ability that grants extra attacks. This ray can also be combined with a touch range spell instead of a weapon. Illuminate- At 6 HD, by two uses, any creatures hit by the Aasimar's weapons or failing a save against his spells must make a Will Save DC 10+1/2HD+Cha mod or be blinded for 1 round per Aasimar HD. Rising Star: At 8 HD, by two uses, the Aasimar can fly at a speed of 20 feet per HD with perfect maneuverability. If the Aasimar spends another use at the begginning of his next turn he can remain flying, otherwise he falls. Brilliance: At 10 HD, by three uses, the Aasimar's attacks count as touch attacks. Heaven touch: At 12 HD, by four uses and as an immediate action the Aasimar may grant himself a sacred bonus on Saving throws, AC and skill checks equal to his Cha bonus. He can extend the duration of this by spending an extra use at the begginning of his next turn. Star Blessing: At 14 HD, by four uses and as a free action even if it isn't his turn and/or he can't act normally the Aasimar may grant himself a Freedom of Movement and Death Ward effects like the spells. He can extend the duration of this by spending an extra use at the begginning of his next turn. Judge: At 16 HD, by five uses, creatures struck by the Aasimar's attacks or failing saves against his spells or SLAs must make a Will Save DC 10+1/2HD+Cha mod or be Dazed for 1 round. Creatures hit by multiple attacks or failing the save against multiple spells stack the duration. (so a creature struck four times by the Aasimar when this ability is used and failing all four saves would be dazed for four rounds). Star-Reach: At 18 HD, by six uses, the Aasimar can project a light beam from his weapon as far as the eye can see, providing him basically infinite reach. He can attack any oponent in his line of sight he can spot with melee attacks, ranged attacks and/or spells whitout penalty of any kind and using the normal bonus for the attack. Purify: At 20 HD, by seven uses, the Aasimar can replicate a Mormekdain's Disjuction spell with CL=HD as a standard action, except that he's himself always affected regardless of the chosen area and magic items don't permanently lose their properties if the Will save is failed, they simply stop to fuction for 1 round per HD. Save DC 10+1/2HD+Cha mod. Ability increase: The Aasimar gains +1 to Wis and +1 to Cha. The Aasimar gets some bonus to Wis, Cha, skills, resistances and the ability to produce daylight. Wich could probably qualify for worst spell ever. So I decided to focus on boosting the daylight. As the Aasimar grows it can use it's daylight in all kinds of powerfull ways, but it burns trough uses pretty fast, since it's still just a 1 level class after all. Proficiencies: Tieflings are proficient with simple and martial weapons and light armor. Unholy Body:At 1st level an Tiefling loses all racial bonuses it had and gains outsider traits (basically darkvision 60 foot). It is an outsider with base speed 30 ft.
An Tiefling gains a bonus on Bluff and Hide checks equal to her HD and resistance to fire, cold and electrecity equal to half her HD. Darknessbringer: 1/day per HD the Tiefling can use Darkness as a SLA. If she uses her Darkness on her weapon, she can add her Int to to Hit and Damage rolls with that weapon for the duration of the SLA. As she grows stronger, an Tiefling learns how to use her power in more powerfull ways. All of the following abilities, unless otherwise noticed, are activated as a swift action, cost a certain number of Darkness SLA uses and last 1 round. Dark Soul-At 2 HD, by one use, the Tiefling can may boost the Caster level of any spell or SLA with the darkness, fire or evil descriptor by 2, and that spell ignores any limit on Caster level it may have. Dark Ray-At 4 HD, by one use, the Tiefling can project darkness rays from a melee weapon. Those rays have a range of 20 foot per HD, hit as a ranged touch attack and deal the base damage as the weapon used, whitout counting for any bonus or penalty for Str or Int bonus. You can perform iterative attacks with this if you have enough Bab or any other ability that grants extra attacksTher ray can also be combined with a touch range spell instead of a weapon. Dim- At 6 HD, by two uses, the Tiefling can create a Darkness so deep only she can see trough it. Even creatures with abilities like blindsense, tremorsense and blindsight must roll spot checks to detect anything inside said darkness. Rising Moon: At 8 HD, by two uses, the Tiefling can fly at a speed of 20 feet per HD with perfect maneuverability. If the Tiefling spends another use at the begginning of her next turn she can remain flying, otherwise she falls. Backstab: At 10 HD, by three uses, the Tiefling's attacks count her enemies as flatfooted. Hell touch: At 12 HD, by four uses and as an immediate action the Tiefling may grant herself a sacred bonus on Saving throws, AC and skill checks equal to her Int bonus. She can extend the duration of this by spending an extra use at the begginning of her next turn. Pit Curse: At 14 HD, by four uses, the Tiefling may use Bestow Curse as the spell as a swift action, with save DC being 10+1/2HD + Int mod, except that even if the enemy makes the save, they still suffer the curse effect for 1 round. In this case, the Tiefling may expend another use of Darkness as a free action every turn to further extend the effect of the curse for another round. A failed will save still means a permanent curse. Corrupt: At 16 HD, by five uses, creatures struck by the Tiefling's attacks or failing saves against her spells or SLAs must make a Will Save DC 10+1/2HD+Int mod or lose all their resistances and immunities for 1 round. Creatures hit by multiple attacks or failing the save against multiple spells stack the duration. (so a creature struck four times by the Tiefling when this ability is used and failing all four saves would lose all resistances and immunities for four rounds). Extending Shaddow: At 18 HD, by six uses, the Tiefling can dissolve into shaddows, and then reform in any place she could spot before initiating this ability. Darkle: At 20 HD, by seven uses, the Tiefling can replicate a Energy Drain spell with CL=HD as a standard action, except that it ignores immunity to negative energy, affecting even undeads, and victims can atempt a Will save with DC 10+1/2HD+Int mod at the begginning of their turns to remove one negative level inflicted by this ability, every turn untill all the negative levels caused by this ability are gone. Ability increase: The Tiefling gains +1 to Int and +1 to Dex. The Tiefling gets some bonus to Int, Dex, skills, resistances and the ability to produce Darkness, wich isn't very hot. So I decided to focus on boosting the Darkness. As the Tiefling grows it can use it's Darkness in all kinds of powerfull ways, but it burns trough uses pretty fast, since it's still just a 1 level class after all. Animated Object- The Half Animated Object Golem gains a weapon based on the object selected to replace the limb, this cannot be changed after it has gained Golemaic Weapon. Multislam- Objects that have multiple outstanding appendages grant the Half Animated Object Golem an additional Slam attack, further the critical multiplier on its slams increases to a x3. Constriction- Objects that have long flexible materials grant the Half Animated Object Golem the Improved Grab special ability, allowing it to initiate a grapple on a successful slam attack without having to make a touch attack or provoke an attack of opportunity. Further, on a successful grapple check, the Half Animated Object deals constriction damage equal to its slam damage. Trample-Animated Weapon GraftBlood-Cadaver-Burgled Bite-Commandeered Claws- By replacing its hands with those from a creature with two natural claw attacks, or two creatures with a natural claw attack each, the Half Cadaver Golem gains 2 claw attacks that deals 1d4 damage. Taken Talons- By replacing its hands with those from a creature with two natural talon attacks, or two creatures with a natural talon attack each, the Half Cadaver Golem gains 2 talon attacks that deals 1d4 damage. Hustled Hooves- By replacing its feet with those from a creature with two natural hoof attacks, or two creatures with a natural hoof attack each, the Half Cadaver Golem gains 2 hoof attacks that deals 1d4 damage. Ascertained Arm- The Half Cadaver Golem attaches another arm its body, which it may use freely as if it were one of its own. This extra limb is treated as having -4 Strength and Dexterity compared to the original arms of the Half Cadaver Golem. This arm can be used to manipulate weapons, and as such the Half Cadaver Golem becomes eligible for multi-weapon fighting feats, unless it loses this extra arm. Borrowed Wings- By thieving the wings of a sufficiently sized creature (no smaller than the Half Cadaver Golem) the Half Cadaver Golem gains a Wing attack that deals 1d6 damage, and falls at a rate of 40 feet per round, never suffering more than 1d6 falling damage from any height. Thieved Venom-Robbed Crusher- By replacing key body parts with those of a creature that has the improved grab and constrict special abilities the Half Cadaver Golem gains Improved Grab ability, allowing it to initiate a grapple on a successful slam attack without having to make a touch attack or provoke an attack of opportunity. Further, on a successful grapple check, the Half Cadaver Golem deals constriction damage equal to its slam damage. The Half Cadaver Golem may rob either one of these abilities individually, if it comes across a creature with one and not the other, but this weapon takes the full slot, if the Half Cadaver Golem wants both aspects of this weapon it must rob from a creature that has both aspects. Candle Wax-Coal-Colossus Flesh- As a free action, 1/Minute, the Half Colossus Flesh Golem may release a wave of negative energy which emanates out in a 10 foot cone in front of the Half Colossus Flesh Golem, plus 5 feet for every 3 HD. Any creature caught this emanation suffers 1d4 negative energy damage per HD, Will save DC (10+1/2HD+Con Mod). Undead creatures are healed by this effect as they would be by an Inflict Wounds spell. Non-undead creatures that are damaged by this attack must make a Fortitude save of the same DC, regardless if they passed the previous save or not, or suffer 1d4 points of physical ability damage as chosen by the Half Colossus Flesh golem with the use of each attack. This Ability Damage increases by 1 size category for every 6 HD the Half Colossus Flesh Golem has. Colossus Iron-Colossus Stone- As a free action, 1/Minute, the Half Colossus Stone Golem may release a violent vibration of energy which emits a 10 foot cone of sonic energy in front of the Half Colossus Stone Golem, plus 5 feet for every 3 HD. Any creature or object caught in this area suffers 1d4 sonic damage per HD, Fortitude save DC (10+1/2HD+Con Mod) for half. This attack deals double damage to objects and constructs, and this is increased to triple damage if the object or construct is particularly crystalline. Further any creature so damaged must make an additional Fortitude save of the same DC or be deafened for 1d4+1 rounds. Greater Stone-Grisgol-Mask-Razor- As part of a Full-Defense action the Half Razor Golem can surround itself with a whirling, slicing shield of razors, Any creature adjacent to the Half Razor Golem suffers 1d8 slashing damage per 2 HD of the Half Razor Golem, a successful Reflex save DC (10+1/2 HD+Dex Mod) reduces this damage by half. Any creature or object entering or passing through a square adjacent to the Half Razor Golem is subjected to this damage without a saving throw. The Half Razor Golem further gains a one half cover from this ability granting it a +4 cover bonus to AC. Unlike the Half Chain Golem the Half Razor Golem may take a move actions while this ability is activated, but creatures subjected to this attack by the Half Razor Golem moving adjacent to them still receive a reflex save against this attack. A Half Razor golem may use this ability a number rounds per day equal to twice its HD. Remnant-Sickstone-Survey Stone- The Half Survey Stone golem gains a second slam attack, in addition 1/minute the Half Survey stone golem may make an expeditious charge attack. While making an expeditious charge attack the half Survey Stone Golem may use a charge action to move up to 4x any of its base speeds (5x if it has the Run feat), further upon ending the charge the Half Survey Stone Golem may attack with both of its natural slam attacks rather than just one. With the Son/Daughter of Silence, may they take levels in Bard? Proficiencies: A nimblewright is proficient with its natural weapons and rapiers, but with no armor or shields. It is Medium size and has a land speed of 40ft. A nimblewright has a natural armor bonus equal to its strength modifier or its charisma modifier, whichever is higher. Rapier-Hands: The Nimblewright fights with two rapiers that are actually parts of its body. These rapiers are treated as natural weapons. When not in use, the weapons fold into its forearm and it can use its hands normally. A nimblewright can fully deploy both rapiers as a free action. Each rapier does (1d6 18-20x2) damage at level 1, which increases at fourth level to (1d10 18-20x2) at level 4, and increases again to (2d6 18-20x2) at level 7. When making a full attack a nimblewright may attack with both rapier-hands at no penalty (one attack with each rapier-hand at its full base attack bonus), but since its rapier-hands are treated as natural weapons it gains no additional attacks due to a high base attack bonus. Although its rapier-hands are treated as natural weapons, they can be enchanted or re-built with special materials like cold iron or adamantine. Also, as a full-round action, a nimblewright may detach its rapier-hands and wield them as rapiers rather than natural weapons. In this case the damage returns to (1d6 18-20x2), but the nimblewright may make multiple attacks due to a high base attack bonus and any feats it took for its rapier-hands still apply to the rapiers if they could normally apply to manufactured weapons (Weapon Focus would apply, Improved Natural Attack would not). When a nimblewright does this it is considered to have the Two-Weapon Fighting feat and meets pre-requisites as if it had that feat. 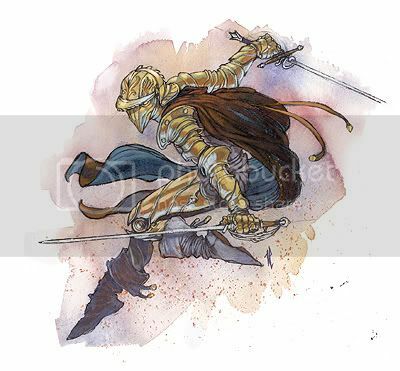 Feats, maneuvers, and other abilities that would allow a creature to attack with more than one weapon as a standard action also allow a nimblewright to attack with both rapier-hands as a standard action. A nimblewright must still meet prerequisites for any such abilities should it choose to take them, although the nimblewright may ignore any racial prerequisites. Body Adaptation: As the spirit that animates the nimblewright grows accustomed to its construct body, it grows more apt in its use. At every level including 1st, it gains +1 Dexterity and +1 Strength or Charisma, but not both. At 5 HD it gains +1 bonus hitpoint per HD, this bonus increases to +2 at 10 HD, +3 at 15 HD, and +4 at 20 HD. Entropic Shield: A nimblewright can use entropic shield, as the spell, as a spell-like ability 4 times per day. The miss chance granted by this spell-like ability increases by 10% at the third, fifth, and seventh nimblewright levels. At fourth level a nimblewright can activate entropic shield as a move action, and at sixth level it can activate its entropic shield as a swift action. At seventh level a nimblewright can choose to activate its entropic shield as an immediate action, but if it does so the duration for the spell is decreased to 1 round. Tripping Thrust:Bonus Feats: A nimblewright gains Combat Reflexes at level 2, and Combat Expertise at level 4 even if it does not meet the prerequisites. If it already has either of these feats, then it may select any other feat for which it meets the prerequisites. Spell Resistance (SR): A nimblewright gains Spell Resistance 13 + HD, which increases to 15 + HD at level 5, and 17 + HD at level 7. A nimblewright can lower or raise its Spell Resistance as a free action at any time should it choose to receive friendly spells. It does not have to be the nimblewright's turn for it to lower or raise its spell resistance. The Swat special ability is the exception to this rule. Feather Fall (Su): A nimblewright is under a constant feather fall effect, as the spell. It can dismiss or reactivate this effect as a free action at any time, even if it is not its turn. Special Abilities: At third level and every level thereafter, a nimblewright gains a special ability of its choice from among the following options. Beat (Ex): You may make a disarm attempt without provoking an attack of opportunity. If you have the Improved Disarm feat, you gain +2 to the disarm attempt in addition to the +4 from the Improved Disarm feat. If you are successful your target provokes an attack of opportunity from you at a +4 bonus. Like Water (Ex): When an opponent gives you a chance to make an attack of opportunity, you may instead opt to immediately take a 5-foot step. This 5-foot step does not count as your 5-foot step for the round, and you may take it every time anyone provokes an attack of opportunity from you. You can also use a free action to sacrifice an attack of opportunity for the round to make a 5 foot step at any time during your turn, or as an immediate action if it is not your turn. Parry (Ex): When an enemy makes a melee attack against you, you may give up one of your attacks of opportunity for the round to make an attack roll as an immediate action. Use the higher of your AC or the result of your attack roll as your effective AC against the incoming attack. You cannot use this special ability if you are denied your dexterity bonus to AC. If you have the Beat special ability and threaten the opponent you parried, you may make a disarm attempt as a free action against the same opponent. Riposte (Ex): When an enemy you threaten makes a melee attack against you and you avoid damage using the Parry special ability, that opponent provokes an attack of opportunity from you at a -5 penalty. You cannot use this ability without the Parry special ability. Swat (Ex): To use this special ability you must forego the benefits of your spell resistance and give up an attack of opportunity for the round. You infuse your rapier-hands with anti-magic to empower a melee attack against a flying enemy. If your attack is successful, you deliver an anti-magic jolt that causes your target to fall according to their means of flight. If your target was flying by magical means, they risk having their flight spell dispelled unless they succeed on a caster level check vs. your spell resistance. If you scored a critical hit then their flight is negated as if by an antimagic field. Your spell resistance does not return until 1 round has passed, it returns by itself and requires no action. Deflect (Ex): When an enemy makes a ranged attack against you, you may give up one of your attacks of opportunity for the round to make an attack roll as an immediate action. Use the higher of your AC or the result of you attack roll as your effective AC against the incoming attack. You must declare you are using this ability before you know the result of your enemy's attack, but after you know whether they have overcome any miss chance you possess. You cannot use this special ability if you are denied your dexterity bonus to AC. Reflect (Ex): When you successfully avoid a ranged attack with the Deflect special ability, you may give up an additional attack of opportunity to redirect the attack you avoided to a new target within the range of the original attack. Use the attacker's original attack roll to determine the success of the redirection. Trip (Ex): When you hit with a melee attack you can attempt to trip your opponent as a free action without making a touch attack or provoking an attack of opportunity. If your attempt fails, they cannot react to make a trip attempt against you. You must declare you are using this special ability and give up one of your attacks of opportunity for the round before you make your attack. Dextrous (Ex): You may use your dexterity modifier instead of your strength modifier when making trip, disarm, grapple, bull rush, or overrun attempts. Feat: A nimblewright may learn a feat in place of a special ability. Spell-like abilities: A nimblewright gains several spell-like abilities, which it can use a limited number of times per day. At fourth it gains cat's grace 3/day, at fifth level it gains alter self 4/day, and at sixth level it gains haste 3/day. The caster level for a nimblewright's spell-like abilities is equal to its HD. Save DCs are Charisma-based. At each even-numbered hit die, it gains an additional use of any spell-like ability it possesses. Repair: A nimblewright may repair damage it has taken with a Craft Check. This takes 8 hours and materials worth (damage taken x Nimblewright's HD) gold pieces. The Nimblewright repairs as many hitpoints as its Craft Check -15. A nimblewright may also re-attach severed limbs this way, although the check is more difficult. Re-attaching a leg adds +10 to the check DC. Re-attaching an arm or rapier-hand adds +20. Re-attaching a head adds +25. Accelerated Self-Repair (Ex): Once per day per 3 HD the Nimblewright possesses, it can initiate a powerful self-repair routine. As a full round action a nimblewright makes a Craft Check (DC 10 + HD, maximum 30 at level 20) to heal as many hitpoints as its base attack bonus. It can take no other actions during this time, not even a 5-foot step, and is denied its dexterity bonus to AC even if it has Uncanny Dodge. Augmented Critical: A nimblewright's rapier-hands threaten a critical on a natural roll of 15-20. On a successful critical hit, its foe is subject to a tripping thrust attack (See above). 2The range at which the Nimblewright can create the column. Larger bodies of water can be manipulated from greater distances. 5The damage the column does to creatures and objects when it touches them and when they are sucked into it. Contact is damage dealt when the column touches a creature or object and can be negated with a successful check to avoid it, and trapped is damage dealt with no save to creatures trapped within the column. 6Creatures above a certain size are too large to be sucked into the column. The time it takes for them to be carried to the top is based on the amount of water used to create the column. 7Examples of different sized bodies of water. At 10 HD the nimblewright may create the column with either a move or a standard action. The nimblewright chooses what type of action to use every time it uses the column ability of Tides, it can alternate between using a move or standard action every time it uses the ability. At this level the nimblewright can also designate allies who can stand atop the column safely - just as it does - assuming there is ample space, although doing so takes the same action as sustaining the column beyond its duration. At 15 HD the nimblewright may direct the column's movement with a swift action instead of a move action, should it choose. The nimblewright can alternate between move and swift action as it sees fit every time it directs the column's movement. Bearing allies safely atop the column no longer requires effort from the nimblewright. At 20 HD the nimblewright may direct the column's movement as a free action. If the column is on a large enough body of water sustaining it beyond its duration becomes a swift action every round for the nimblewright. The column can use the run action and the nimblewright treats the column as if it were a mount whenever doing so would be beneficial. ...Why don't just allow for iterative attacks out of the bat? They just end up working like a Warforged slam attack. It is a natural weapon because it is a part of the creature and gains the benefits and drawbacks of natural weapons. However because the creature is a construct and most of its body made of non-living matter, it can enchant its weapons. I didn't allow for iterative attacks off the bat because that's just how natural weapons work. I try to work within the established rules as much as possible so that what I make doesn't set off alarms with anyone who might use it. To gain iterative attacks with natural weapons you have to take the feats Rapidstrike and Improved Rapidstrike. If your question is then "Why make them natural weapons then?" I did it because I felt like natural weapons offered greater advantage in the long run. It's a construct. When will it ever need to make a Will save? Illusions for one. Also when Eberron came out a lot more spells that target objects or constructs came out with it. In addition to that you even said that many of the best spells allow no spell resistance, so as many of those that offer a will save likely affect a construct. I removed the wisdom bonus in any case, so it's not an issue. I just thought I should explain my original reasoning. Solution: give it a way to patch itself up easily, not necessarily fast healing. Haven't thought of one yet, I looked at some of my options today but will have to resume figuring it out tomorrow. Except that the Savage Species Flesh Golem specifically doesn't have class skills. Since class skills for monsters are decided by their creature type I can only guess that the author of that update missed that. No the author of the update is correct. Monster Manual 2 is 3.0. Savage Species is 3.0. In 3.5 constructs with intelligence scores have skill points, and any creature with skill points has class skills (Although often only one or two). Class skills are not decided by creature type, they're decided by the specific creatures. Even most animals have class skills. As long as it has an intelligence score, it has skill points, and as long as it has skill points, it has class skills. The Zelekhut even has class skills, you figure them out by looking at their entry and breaking down the math. It has 8 hit dice with 2 + int per level with 4x at first level. It has no intelligence bonus (10 intelligence), so just 22 skill points. Enough to get two skills to max or to sprinkle the skill points around. It also gets a +4 racial bonus on Search and Sense Motive. Its maximum ranks in cross-class skills is 5. It has Str 21, Dex 11, Con -, Int 10, Wis 17, and Charisma 15. So by breaking down the math we see that the Zelekhut spent no skill ranks in cross-class skills because it could not have afforded to put 6 ranks into two skills. Also we see that at least the two skills it put 6 ranks in must be class skills because the maximum ranks it can afford in cross-class skills is 5. So the Zelekhut must have Listen, Search, Sense Motive, and Spot as class skills because although it only has 5 ranks in Sense Motive and Search it couldn't have afforded 5s if those were cross-class because it spent 12 of its 22 on Listen and Spot. I would also say it probably has Survival as a class skill since it gets a racial bonus, but it just didn't bother putting any ranks in it. The Nimblewright's 3.5 entry shows it has ranks in Jump and Tumble. So at the very least it has those two skills as class skills. In my first draft of the Nimblewright class I had every skill that its description suggests it has (Bluff, Disguise, Diplomacy, and I considered Forgery, Gather Information, and Sense Motive but decided that was spreading it thin for a 2 + int monster). Yes. But they'll have to use their bardic song abilities they'll have to use Devour Sound to be able to sing. Bloody Initiate:Like the new version a lot more than the other! Hmmm... I think I'll try my hand at the cloaker, if you don't mind. Proficiencies: A cloaker isn't proficient with any armor or weapons, besides its own natural weapons. Cloaker Body: The cloaker loses all other racial bonuses, and gains Aberration traits, a land speed of 10ft and a fly speed of 40ft (average maneuverability). It gains a tail slap (1d4+Str) and a bite (1d3+1/2 Str) as natural weapons. Its natural armor bonus is equal to its Con modifier. A cloaker has no limbs capable of manipulating objects. It may wear up to three rings but no other magic items. Mundane Disguise (Ex): A cloaker can fold itself up so it appears to be a normal robe or cloak, made for a creature of its size or one smaller. An observer must succeed on a Spot check opposed by the cloaker's Disguise check to notice the cloaker is really alive. The cloaker receives a +10 bonus on this check, and may automatically begin grappling any creature attempting to wear it as a free action (including the use of its Engulf special attack, if it has it). Absorb Cloak (Ex): A cloaker can absorb a cloak or robe into its body as a full-round action. If it wishes, the cloaker may change its appearance while using Mundane Disguise to resemble the last item it so absorbed. If the item was magical the cloaker may take in the enchantment of that item, gaining its benefits. A cloaker may "wear" up to eight robes or cloaks at a time in this manner. The cloaker may expel any number of these items from its body as a standard action. If it is slain they materialise inside its body and can be cut out. Ability Score Increase: The cloaker's ability scores increase by the shown amount. Moan (Su): At 2nd level a cloaker can emit dangerous subsonic moans. This is considered a form of bardic music - his cloaker levels stack with bard levels to determine his daily uses and the strength of abilities based on bard level. Cloakers are immune to the moans of other cloakers, but not to other bardic music effects created by them. Unless otherwise specified, moans are [Sonic, Mind-affecting] abilities, and a creature that successfully saves against one of these effects cannot be affected by the same moan effect from the same cloaker for 24 hours. All save DCs for moan effects are Charisma-based. A cloaker knows one Moan per 3 ranks of Perform (moan). Unnerve: All enemies within a 60-foot spread automatically take a -2 penalty on attack and damage rolls for as long as the cloaker continues to moan or until they can no longer hear the moan. Trance: All enemies within a 60-foot spread must succeed on Will saves or be affected by a hypnotism effect as long as the cloaker continues to moan or until they can no longer hear the moan. Fear: All enemies within a 30ft spread must succeed on Will saves or become shaken for 1 round per HD of the cloaker. At 5HD victims instead become frightened on a failed save or shaken for 1 round on a successful one. At 9HD they become panicked on a failed save and shaken on a successful one. Nausea: All enemies in a 30ft cone must succeed on Fortitude saves or be overcome by nausea and weakness. Affected characters become sickened for 1d4+1 rounds. At 5HD victims instead become nauseated. At 9HD they also fall prone, and are sickened even if they succeed on the save. Stupor: A single creature within 30 feet of the cloaker must succeed on a Fortitude save or be affected as though by a hold person spell. At 8HD the cloaker may create a hold monster effect instead. Growth: At 3rd level the cloaker grows to Large size. Its bite attack retains the reach of a creature one size category smaller. Shadow Shift (Su): At 4th level a cloaker can manipulate shadows. He gains access to the following abilities, usable 1/day per HD: blur, mirror image, silent image. These abilities function only within the area of a shadow and their effects are suppressed if they are moved out of the shadows. At 12HD this restriction is removed. Engulf (Ex): At 5th level a cloaker can try to wrap a creature of one or more size categories smaller in its body as a standard action. The cloaker attempts a grapple that does not provoke an attack of opportunity. If it wins the grapple check, it establishes a hold and bites the engulfed victim with a +4 bonus on its attack roll. It can still use its whiplike tail to strike at other targets. Attacks that hit an engulfing cloaker deal half their damage to the cloaker and half to the trapped victim. Engulfed creatures take a -2 penalty on saving throws against the cloaker's Moan. As a full-round action, an engulfing cloaker may attempt to disarm a cloak worn by the victim; if successful it is immediately absorbed. [spoiler]The cloaker's highest ability score is Str, followed by Con. Cha bonuses are there to make certain levels sweeter. Because someone who focuses on manipulation might not want a size increase otherwise. Rather than increase Con, I gave it a higher HD size (d10 rather than d8). The moan's uses per day do not advance by character level like most monster abilities, but can be improved by bard levels. Or you could enter a PrC which has bardic music as a prereq and skip straight to the exotic stuff. The Unnerve moan covered ground similar to two bard abilities, and the secondary effect was too powerful and took too long to use, so I split it into two moans for greater compatibility. In addition, the moans now affect enemies only, since they otherwise interfere with the other members of your party (note the MM cloaker's organisation entry - they don't need that part since the only creatures they ever ally with are other cloakers). Skills (6+Int): Add Intimidate to the cloaker bard's skill list, remove Diplomacy and Gather Information. Deep music: Whenever a cloaker bard uses his Moan ability he makes a Perform (moan) check. The result of this check becomes the saving throw DC for that usage of the moan. Dark Fascination: The range of the cloaker bard's Trance moan increases to 90ft. 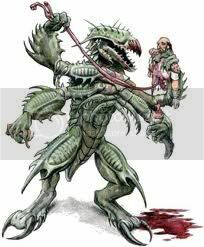 Inspire Dread: Creatures who hear the cloaker bard's Unnerve moan continue to be affected after they can no longer hear it for a number of rounds equal to the cloaker's Cha modifier. The penalty inflicted by this moan is equal to a normal bard's Inspire Courage bonus +1. Effects which increase the bonus provided by Inspire Courage increase the penalty inflicted by this ability. Deep Magic: A cloaker lord can prepare and cast arcane spells as a Wizard of its class level +2 (stacking with any wizard levels it may gain). A cloaker lord receives Eschew Materials and Shadow Weave Magic as bonus feats, but cannot specialise in a school. Like a bard, its spells always have verbal components. If you do not possess the Forgotten Realms Campaign Setting or , use the following description for the Shadow Weave Magic feat. The saving throw DCs of your enchantment, illusion and necromancy spells increase by 1, and you gain a +1 bonus on caster level checks made to overcome spell resistance with such spells. However, your caster level for evocation and transmutation spells is reduced by 1 unless they have the Darkness descriptor. You forever give up the ability to cast spells with the Light descriptor, as if they belonged to the barred school of a specialist wizard. Heart of Darkness: A cloaker lord develops a new organ within its body which is the source of its improved abilities, the shadow core. The cloaker lord may scribe spells into its shadow core as if it were a spellbook, but at half the normal cost (a shadow core never runs out of "pages". When the cloaker lord is slain its shadow core remains intact for 1d4 days (this period can be extended by the gentle repose spell); in this time a wizard may attempt to copy spells from it as if it were a normal spellbook, though Spellcraft DCs are increased by +4 due to the unusual medium. Moan: The cloaker lord's levels in this class count as cloaker levels for determining the number of times it can use its moans per day. Ability Score Increase: The cloaker lord's ability scores increase by the shown amount. Spell Resistance (Su): At 2nd level a cloaker lord gains Spell Resistance equal to 11 + its HD. Improved Natural Weaponry: At 2nd level the cloaker lord's natural weapons increase in damage by one size, to 1d8 (tail slap) and 1d6 (bite). Improved Speed: At 2nd level a cloaker lord's fly speed increases by +10ft. Cloaker Lord (Ex): At 3rd level a cloaker lord has power over lesser cloakers. Normal cloakers are no longer immune to the moans of a cloaker lord and take a -2 penalty on saving throws against his special attacks. In addition he gains a +4 bonus on Bluff, Diplomacy and Intimidate checks made against them. A cloaker lord Engulfing another cloaker may disarm and absorb a cloak they have absorbed as if they were wearing it normally. Finally, it may absorb cloakers it slays as if it had the Consume Body feat. Growth: At 3rd level the cloaker lord grows to Huge size. Benefit: When an opponent you are engulfing dies or is destroyed, you can absorb their body as a free action (providing the body was not destroyed in the process). This grants you 2 temporary hit points per HD of the victim for 1 hour, and prevents any form of resurrection which requires part of the corpse. If they are wearing any cloaks or robes you may absorb these at the same time; other items drop to the ground. Prerequisites: Spell Mastery, Knowledge (dungeoneering) 3 ranks, must possess a shadow core taken from a cloaker lord. Benefit: You conduct a ritual where you swallow a pilfered shadow core and fuse with your own body. This prevents the core from decaying and allows you to use it as a spellbook with unlimited pages. Like a cloaker lord, you pay half cost to scribe spells into a shadow core. In addition, this bond makes you more like a cloaker lord yourself. You gain a +1 bonus to caster level for all spells with the Darkness descriptor, and a +2 bonus on Bluff, Diplomacy and Intimidate checks made against cloakers other than cloaker lords. Special: A cloaker lord may select this feat if he consumes the shadow core of another cloaker lord, even if he does not meet the prerequisites. The consumed shadow core merges with his own, and the skill bonuses stack with his existing skill bonuses. Benefit: The range of one of your moans is increased by +30ft, and its DC is increased by 1. Special: You may select this feat multiple times. Each time it applies to a different moan. Benefit: You may engulf creatures of your size category or smaller. In addition, you gain a +2 bonus on damage rolls against engulfed opponents with your bite attack. Normal: You may only engulf a creature if it is at least one size category smaller than you. Benefit: When using a cloaker as a mount, you may additionally have it occupy your cloak slot. While doing so the cloaker cannot use its bite attack, but can grant you the benefits of up to two of the cloaks it has absorbed (this suppresses the effects of any existing cloak you are wearing, as normal when equipping two magic items to the same slot). The cloaker may change the cloak enchantments it grants as a move action. The cloaker may also grant you its immunity to the moans of cloakers if it wishes. I'm curious; why are you guys always breaking up ability score bonuses into +1s? Also, the cloaker needs an ability so that it can enchant its body as if it were a cloak. What if it can eat cloaks (a la the tarrasque class) and take on their appearances? Maybe it has the same number of body slots as any creature, but all of them are eaten cloak slots. Because giving them on +2 or higher on a single level would be too high for my tastes. Altough some monsters here do break this rule, like the Duergar and Pixie. The gnoll gets an exceptional +4 to Str, altough it's a one level class. Prime32:Excellent job with the cloaker! It captures the essence of the monster, but you take the care of making it player/party-friendly and offer a path for after the cloaker levels are finished. -Mundane disguise doesn't scale? DC 20 is nice for 1st level, not so much when you're at medium-high levels. -You really should focus on just a couple scores. I believe it would be best swaping that single +1 Con for another +1 Cha. -Bard substitution level doesn't have the "cloaker body" ability, and has countersong and has a bunch of bard abilities listed but not explained. If it was your intention then put the abilities explanations (or just "as bard"). As is, though, when you have a +1 bonus, half the time it's mechanically identical to a +2, and half the time it's identical to a +0, due to how bonuses work. It makes the progression more predictable to have a +2 every other level than a +1 every level. It was based on the gargoyle's Freeze ability, which doesn't scale and doesn't have any formula I can determine. Likewise the gelatinous cube's Transparent ability does not scale. I'm not sure how to tie it into the Hide and/or Disguise skills (+10 on Disguise checks to impersonate a cloak?). For now I've added the ability to auto-grapple anyone who tries to put you on. Done. Increased the HD to d10 to try to represent its toughness another way. The_Mad_Linguist:Ah, but a single +1 isn't useless half the time. It can help you qualify for feats, make you a little more resistant to ability drain/damage, and allows more sinergy with templates wich grant themselves +1 to an ability score. It was based on the gargoyle's Freeze ability, which doesn't scale and doesn't have any formula I can determine. Likewise the gelatinous cube's Transparent ability does not scale. I'm not sure how to tie it into the Hide and/or Disguise skills. The gelatinous cube and gargoyle are low level monsters that suffer from the non-scaling syndrome that affects a lot of creatures out there. One way I would do it would be making the DC equal to double Hide bonus+HD. So a cloaker 5 with, say, 16 Dex, has 8 ranks on hide, -4 penalty for being large, +7 hide modifier, double that and add HD and you get a DC of 19, pretty close to the original. Wich will then increase +3 for every level from now on if you keep puting ranks in hide, up to +72 at 20 HD. Granted nobody can probably beat that DC, but everybody probably has blindsight of some kind to detect you, so you may as well be immune to peasants rolling natural 20s on their spot checks when you're high level. Or you can make it a fixed DC that benefits from your hide modifier. Like 13+Hide modifier (or ranks if you don't want the large size to interfere), and then it scales with the skill. Oh, I confused something there, sorry about that. ^ See edit: "+10 on Disguise checks to impersonate a cloak?"